GOOGLE PAGE SPEED UPDATE: WILL YOUR HOTEL'S WEBSITE BE IMPACTED? Search Engine Land and our agency Google representative have confirmed that Google’s Page Speed Update is now being released to all users. As of July 9th, 2018, Google “has begun incorporating the new Speed Update algorithm in the mobile search results as a search ranking factor”. Google has confirmed that right now, the update “only impacts the slowest of sites on the internet”. 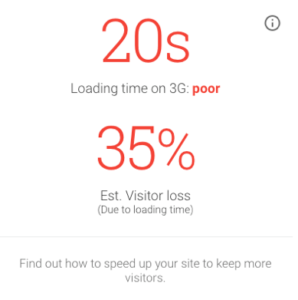 But….what does Google consider slow or the slowest in terms of mobile site speed? Our Google agency representative stated that RANK COULD BE AFFECTED FOR PAGES THAT LOAD SLOWER THAN 3-4 SECONDS. In addition to page rank and organic performance, it’s also important to understand that pages with slow load times also impact your paid advertising performance. How much of the traffic from your hard earned paid advertising dollars are bouncing from your site because the page takes too long to download? This can add up to a lot of wasted advertising dollars. How do you know if Google’s Page Speed Update could impact your website? In Google’s most recent blog post on the Page Speed Update, they state that, “Although there is no tool that directly indicates whether a page is affected by this new ranking factor, here are some resources that can be used to evaluate a page’s performance.” These include Google’s Test My Site Tool. Our Google representative encourages immediate action to improve page speed if your site is loading slower than 5 seconds. Back in May we dove into the importance of mobile page speed for organic search rankings. Now is the time to act, don’t wait until your site is negatively impacted. Chances are, it is already seeing the negative impact of advertising dollars wasted on site visitors that bounce. Reach out to GCommerce today to inquire about how we can help improve your site’s page speed.